Well, we are now in mid-June and I am back in Korea after having spent another great season of field work on the Chinese coast of the Yellow Sea. My last few weeks were spent at Nanpu, Bohai Bay as part of work with my good friend and colleague Peng Hebo, PhD student of the University of Groningen. 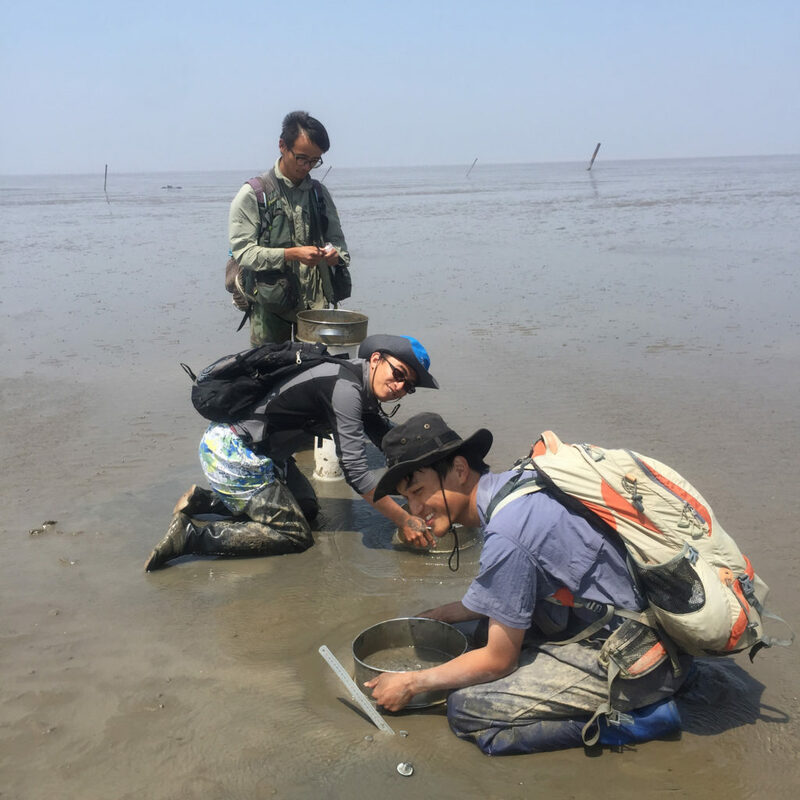 Although the mud at Nanpu can be a bit challenging to work on at times, it’s a small price to pay for the incredible encounters with so many fascinating benthic and shorebird species. By the time I had arrived, many of the Great Knots had already departed, leaving a bit of time to focus on Red Knot and to help with counting and mostly benthic sampling. 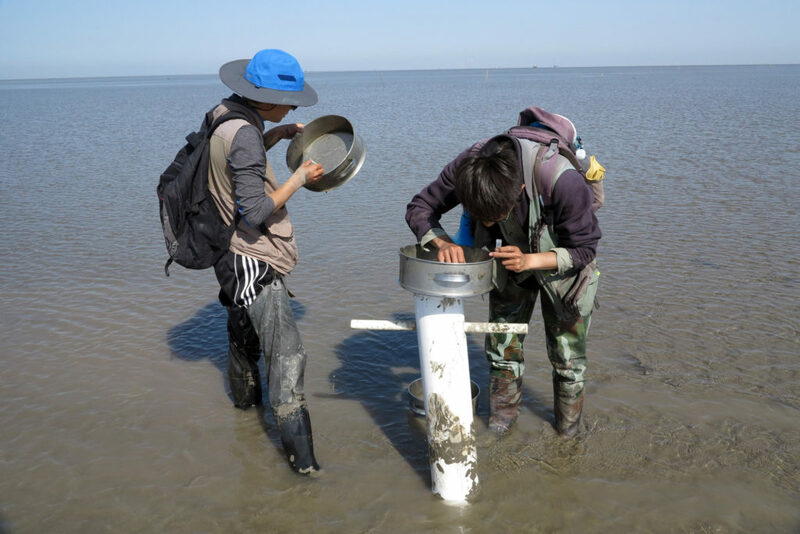 Collecting benthic samples with Peng Hebo and his team at Nanpu. At Nanpu, there was a lot to see. Red Knots (rogersi and piersmai) and Curlew Sandpipers were already dressed in stunning plumages. I’m not a photographer, but sometimes I wish I was, so I could share just how gorgeous these birds can be in preparation for breeding. If you’re reading this, you probably already know! Still, I can’t help but recommend to see for yourself someday, if you are fortunate enough to have a chance to visit during the spring migration season. Good numbers of Sharp-tailed Sandpipers, Broad-billed Sandpipers, hundreds of Relict Gulls and even small flocks of Asian Dowitchers were present. There are many salt ponds which provide good habitat for breeding species such as Gull-billed and Common Terns, Pied Avocets and Black-winged Stilts, and it’s quite common to come across really large flocks of White-winged Black Terns bouyantly flying and feeding over the tops on some of these ponds. The salt ponds are important for thousands of roosting shorebirds, and are also an important source of food for several migrating shorebird species. In the near future, there should be some papers published on the shorebirds of these salt ponds, which I will then highlight again, via our blog. 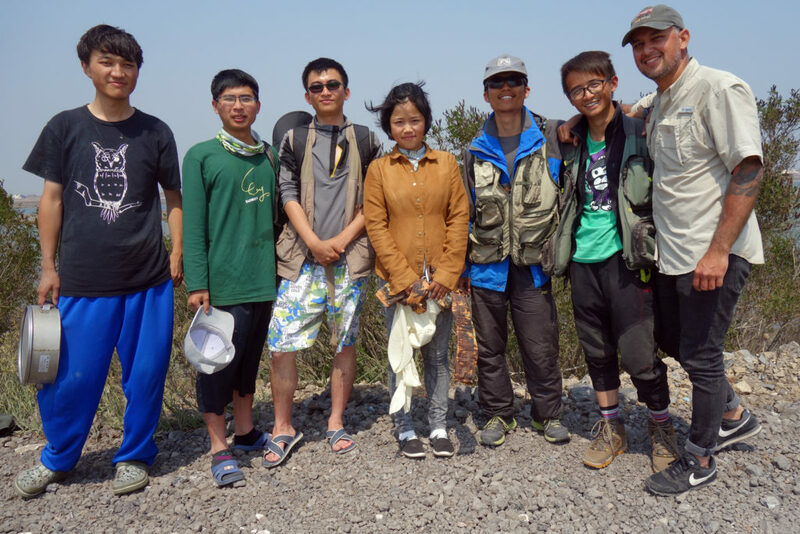 Mu Tong and his team joining us for a photo after their final day of field work at Nanpu. Chris Hassell and Adrian Boyle checking for flags and colorbands. 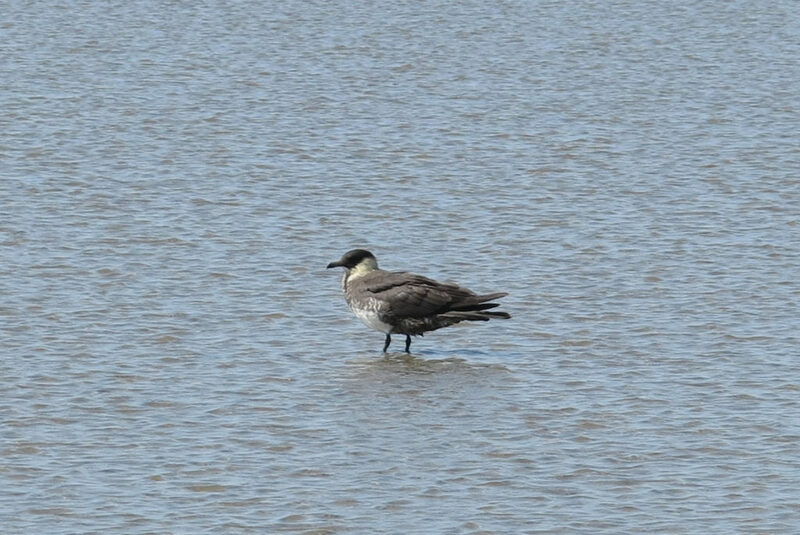 Now, back to bird highlights from Nanpu: I’d have to say my close encounter with a Pomarine Skua really hit the mark. 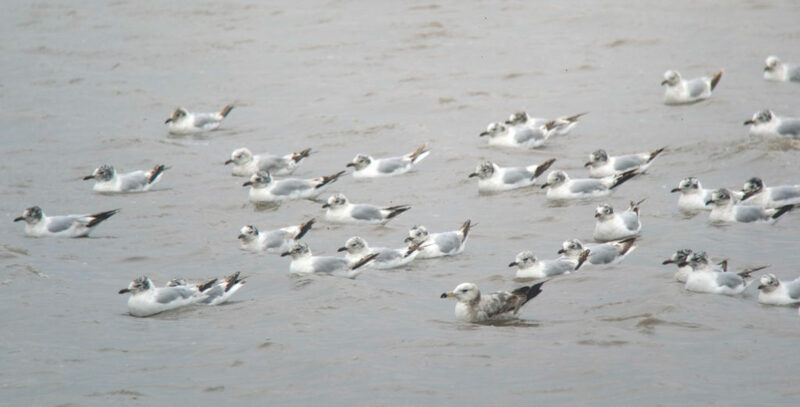 I have seen Pom Skua a few times while seabird-watching in Korea – but never with this kind of close-proximity. The compact camera photo I captured doesn’t compare to what it was like in person, through my binoculars. What a stunner. And at the park in town, I was finally able to see one of my nemesis birds, Lanceolated Warbler. What a skulker. After the first one, I then saw another, and then it was topped off with a Baikal Bush Warbler. Talk about a great day for a walk in the park. 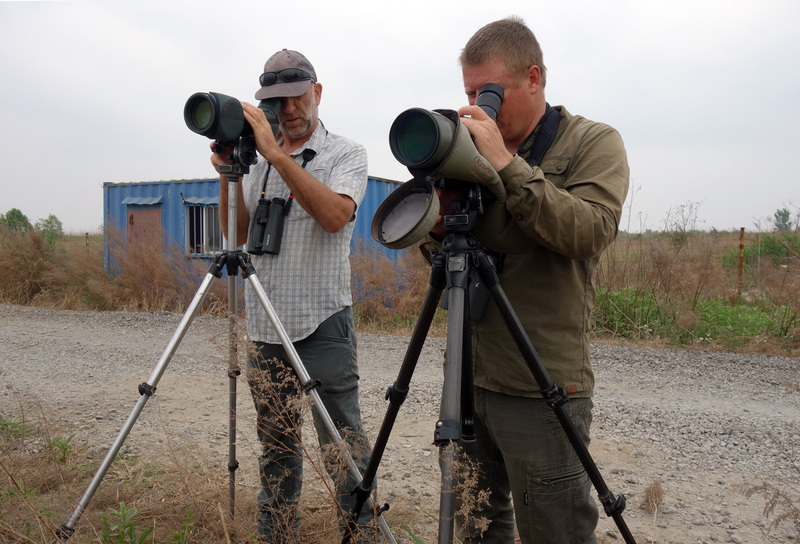 But perhaps the biggest highlight at Bohai was when Adrian Boyle and I were doing a count, and he spotted and put me on a distant Spoon-billed Sandpiper. No matter how many times I see one, it feels special. This individual was un-flagged and it looked to maybe be a second-year bird, mottled and wearing about 75% breeding plumage. I wonder how many Spoonies pass through the Yellow Sea and are unseen. And I’m sure we all wonder how many there really are at the moment. Well, I am fortunate enough to have arrived in Korea just in time for a special mid-summer shorebird survey, with a focus on looking for over-summering Spoon-billed Sandpipers. This research is funded and supported by SBS in China, in coordination with Birds Korea. We began the survey today at the Nakdong Estuary and from tomorrow we head west for a week-long look at the Korean Yellow Sea coastal tidal flats. Please look for an update on the survey to come soon!